On Thursday, Nov. 17, Bazaar Meat by José Andrés, the acclaimed signature restaurant at SLS Las Vegas, welcomes Emmanuel Kemiji, owner of Miura Vineyards and managing director of Clos Pissarra, and invites guests to a special six-course wine pairing dinner. Bazaar Meat Lead Sommelier Chloe Helfand will also join Kemiji and describe how each wine was specifically chosen to pair with the menu by Executive Chef Alex Pitts. The exclusive dinner will begin at 6:30 p.m. and costs $165 per person. Known for producing rich and complex Pinot Noirs, Miura Vineyards represents the finest vineyards California has to offer including Pisoni, Garys’, Talley and Williams Ranch. Established in 1995, Emmanuel was the first sommelier to start a commercial winery in the United States and relied on his unique experience and knowledge as one of America’s first Master Sommeliers to make Miura highly successful for the last 20 years. Clos Pissarra debuted in 2010 in Priorat, about 85 miles southwest of Barcelona, Spain. The name is derived from the Catalan word for slate, which describes the soft, crumbly soil in Priorat’s mountainous terrain. The vines struggle constantly in this brutal and harsh environment, but that is exactly what makes the wines so special. For more information and to make reservations, please call (702) 761-7610 or email bazaarmeat@slslasvegas.com. SLS Las Vegas®, a Tribute Portfolio Resort, is an all-encompassing resort and casino with more than 1,300 guest rooms and suites in two distinctive towers, 80,000 square feet of flexible meeting space and a collection of acclaimed restaurant and nightlife brands. 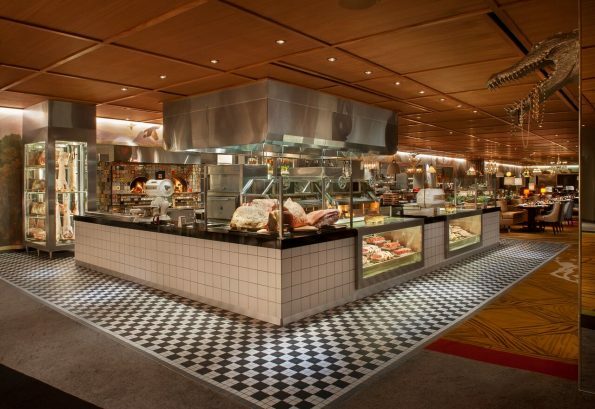 SLS offers an impressive selection of dining concepts including Bazaar Meat by José Andrés™; Katsuya; Cleo®; Umami Burger, Beer Garden & Sports Book; 800 Degrees Neapolitan Pizzeria; Northside Café & Chinese Kitchen and The Perq™. The resort is also home to multiple nightlife and entertainment offerings including Hollywood favorite, The Sayers Club®; the edgy and sophisticated nightclub, Foxtail®; and the intimate, live entertainment venue, The Foundry. SLS Las Vegas also hosts the luxurious Ciel Spa® and a sports book operated by global gaming leader, William Hill. For more information about SLS Las Vegas®, please visit slslasvegas.com and stay connected on Facebook, Twitter, and Instagram.